Today for lunch, Adelaide Food Central was invited to sample The Curious Squire’s new menu. The Curious Squire is home to not only the full range of the James Squire beers but also provides a substantial American style menu. 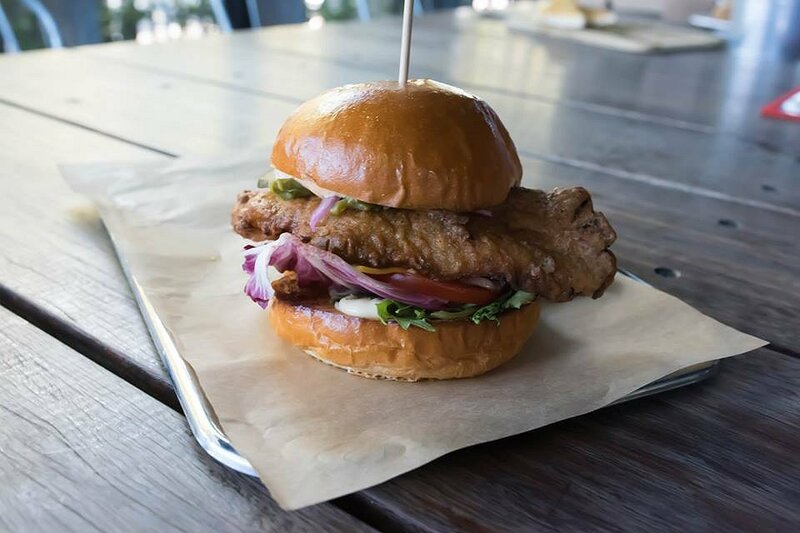 Located just moments from the CBD, on O’Connell Steet in North Adelaide, The Curious Squire is a fantastic pub to have a drink and enjoy a delicious meal with friends. With its opening in 2012, The Curious Squire is popular for its creative menu and bubbly atmosphere. 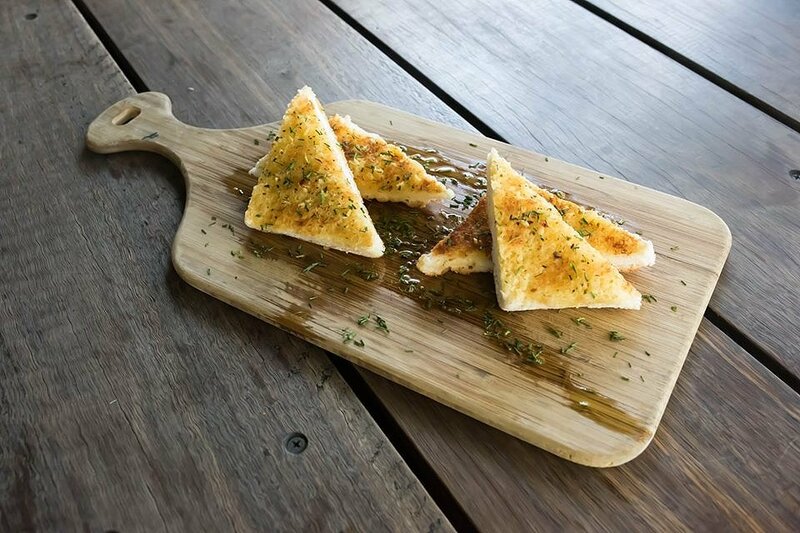 We started off our journey through their new menu with the Garlic Bread – focaccia bread, whipped butter, minced garlic and flat leaf parsley. The bread itself was soft on the bottom and crispy and delicious on the top and there was a good balance of garlic and parsley. Even though the dish was very simple it was extremely flavoursome. The next dish were their signature American Buffalo Wings – crispy fried winglets tossed in frank sauce served with buttermilk ranch. The wings themselves were very crispy and were coated in a spicy frank sauce. 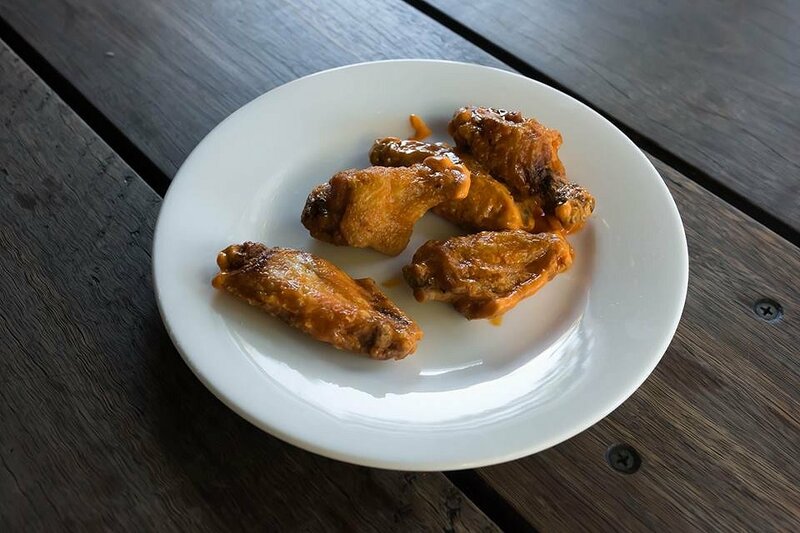 These wings were paired with a creamy and delicious buttermilk ranch, which matched perfectly with the subtle spicy coating. I really enjoyed the light batter on the wings, as sometimes too much batter can loose the chicken flavour altogether. The Curious Squire are famous for their buffalo wings, and on Wednesday’s they have a 50-cent wing night, which is very popular. 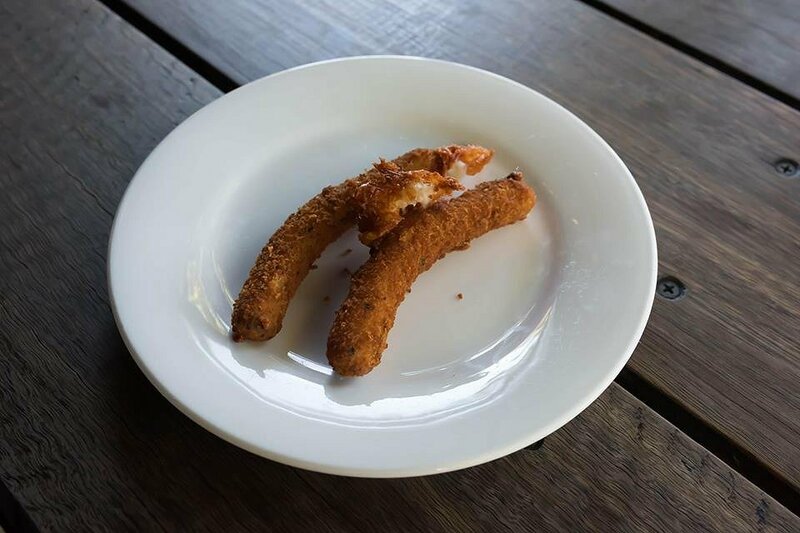 A classic on an American menu are the Mozzarella Sticks – fine crumbed and served with tomato sugo. These sticks were crumbed to absolute perfection and you could see the crumb has been prepared carefully. The mozzarella cheese unfortunately was not gooey but it was still enjoyable to eat as the cheese paired well with the fine crumb. I was unsure as to how the tomato sugo would taste, as we were not in an Italian atmosphere. I proved myself wrong as they did an incredible job with the sugo as it was thick and juicy and paired extremely well with the mozzarella sticks. Even for those who don’t like mushrooms, you’ll love the Stuffed Mushrooms on offer here. 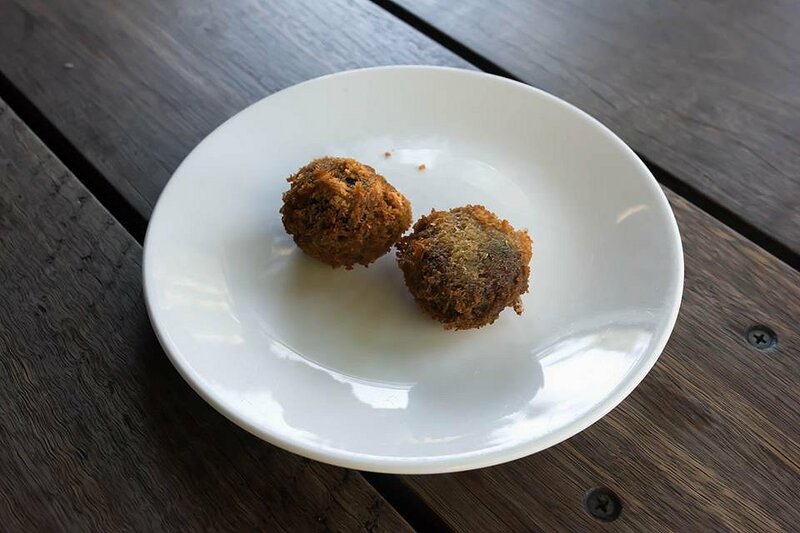 They’re course crumbed, filled with whipped ricotta and served with chimmichurri. The stuffed mushrooms were coated in a thick fried batter and were crunchy and divine. Thick batter can tend be a quite oily but this was cooked perfectly. The subtle crumbly ricotta paired well with the juicy mushroom and thick crunchy batter. I now know for sure that The Curious Squire know how to cook fried food properly. Another American classic were the Mac and Cheese Balls with tomato and balsamic relish. 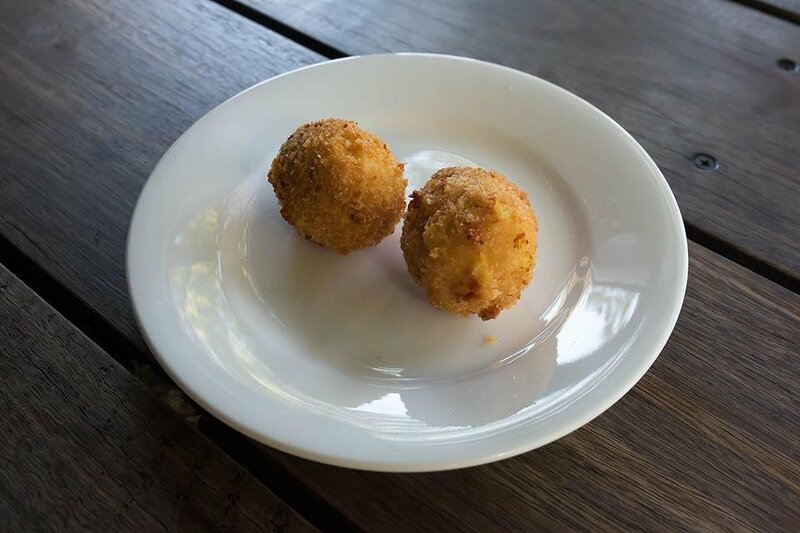 I am an absolute sucker for mac and cheese, and I was very excited to try these mac and cheese balls. I really enjoyed the semi strong cheese that was used as it helped to give the balls flavour and taste, and it paired well with the crunchy fried batter. The sweet balsamic dressing added a slightly sweet flavour to the dish and complimented the mac and cheese balls. One of the favourites was the Southern Fried Chicken Tenders with lime chilli mayonnaise. I really enjoyed seeing a good quality chicken used in these tenders. 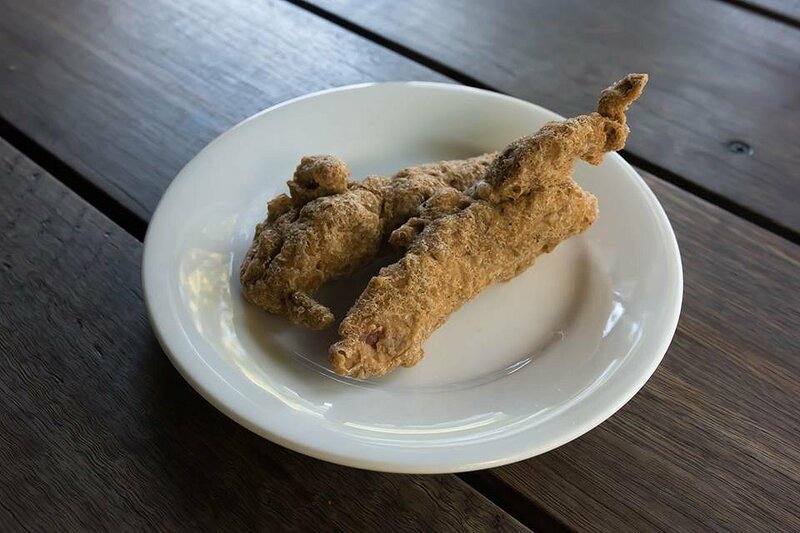 It is often when eating fried chicken the chicken itself can be of low quality. Once again the chicken was fried to perfection and paired well with the slight chilli mayonnaise. The chicken was not too oily which made the entrée pleasant to eat. Continuing the chicken theme was The Mother Clucker burger – Southern fried chicken, guacamole, American cheddar cheese, bacon, chipotle, mayonnaise, lettuce, tomato, onion and pickles. The chicken used in this burger was lightly fried but still had an amazingly crunchy skin. The guacamole was a great addition to the burger and matched perfectly with the crispy chicken. The bacon and cheese helped to give the burger flavour and the lettuce, tomato, onion and pickles provided a fresh element to the dish. All of this was sandwiched between a soft and tasty brioche bun. 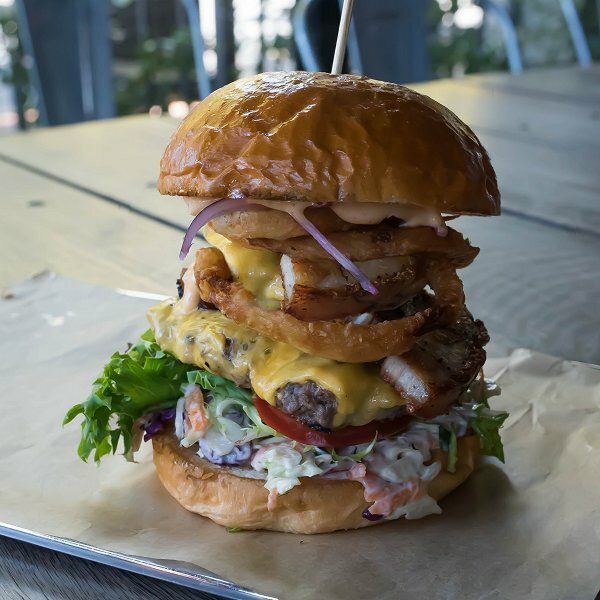 The next dish was their signature burger, The Curious – Beef patty, crispy pork belly, American cheddar cheese, coleslaw, tomato, pickles, lettuce, topped with crispy fried onion rings and Squire sauce. This burger is the burger of all burgers, and you will not be disappointed or hungry walking away from this bad boy. Not only does the brioche bun hold together a juicy beef patty but is also accommodates a succulent pork belly. The cheese melted into the beef patty and was accompanied by the fresh taste of the lettuce, tomato and pickles. The creamy coleslaw added another element of flavour and mixed perfectly with every other component in the dish. The onion rings added yet another dimension to the burger and was crunchy, delicious and fried to perfection. 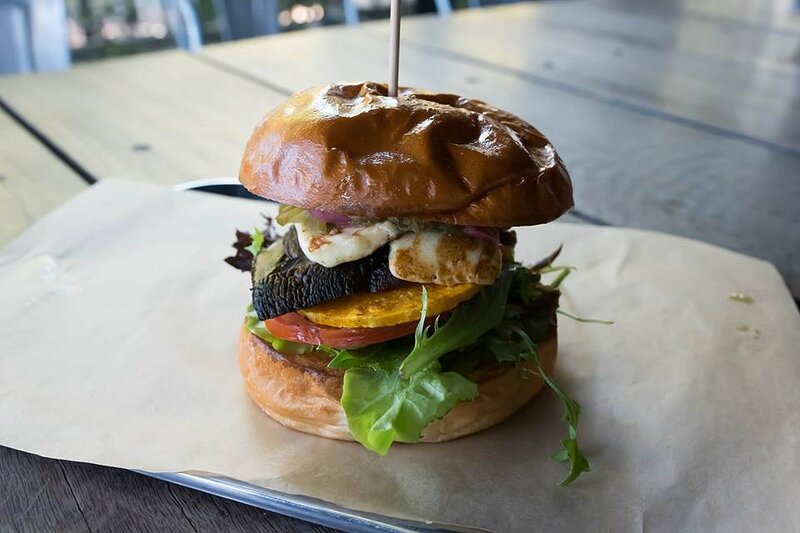 One to please the vegetarians is The Happy Cow – grilled haloumi, Swiss brown mushroom, roasted butternut pumpkin, lettuce, tomato, pickled onion, aioli and chimmichurri. It was extremely substantial for a vegetarian meal and would leave anyone feeling full and satisfied. The mushroom in this burger was extremely juicy and paired well with the lettuce, tomatoes, pickled onion, aioli and chimmichurri. The sweet pumpkin complimented the subtle haloumi and mushroom flavour. All of this was sandwiched between a soft and flavoursome brioche bun. 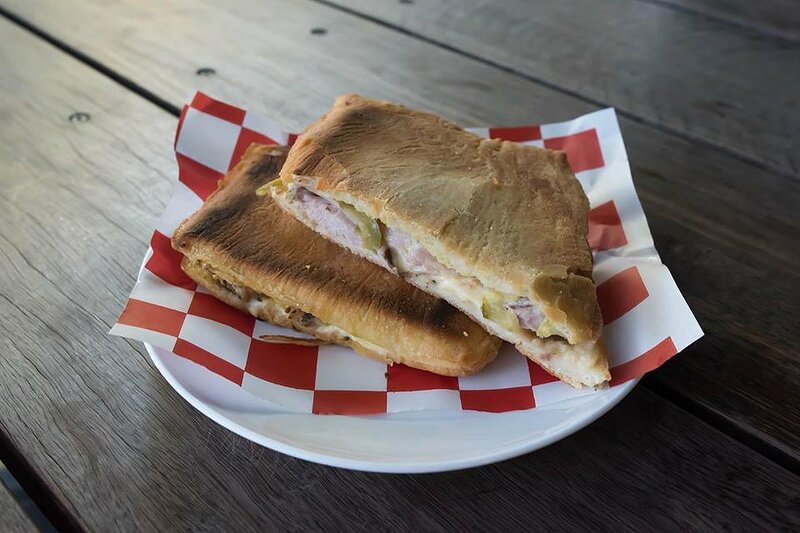 New to The Curious Squire’s late night and lunchtime menu are the cubanos. We opted for the Traditional Cubanos with mojo pork, shaved leg ham, pickles, mustard seed and queso. The pork and leg ham paired well together, even though they come from the same animal, and their different textures complimented each other. The cheese helped to give the dish fuller flavour and the sweet pickles added some sweetness to the meal. 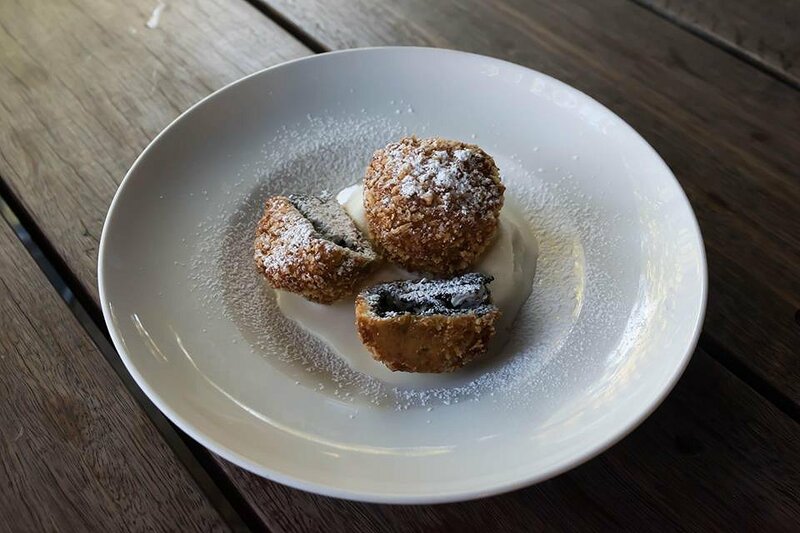 How could we leave without trying their dessert menu, take us to the Deep Fried Oreos – course crumbed with vanilla ice cream. Oh my gosh is all I can say. I have heard about this delicious part of their menu for a while now but I didn’t realise they would be as good as they were. The chef explained to us that there is a long process to actually get the Oreos to taste as good as they do. The first step is to stack 3 Oreo’s together to create a larger Oreo. They then cover the Oreo with pancake batter and put them in the deep fryer. After they have been cooked they crumb them with panko crumbs and maple syrup. You can taste the beautiful sweetness of the maple syrup, the crumbly chocolate biscuit from the Oreos and the delicious crunchy batter. The vanilla ice cream helped to add a creamy and cold element to the dish. The Curious Squire is open Sunday and Tuesday 12pm-11pm, Wednesday and Thursdays 12pm-12am and Friday and Saturday from 12pm-2am. If you are a sucker for burgers or deep-fried American food then The Curious Squire is the place to go. Their substantial menu not only looks after meat lovers but vegetarians also. We would like to thank Daniel Tropeano and the team at The Curious Squire for giving us a sneak peak at their new menu.